I’m not sure why I never noticed before, but ever since I started using an iPhone, I’ve noticed one simple thing missing from the design of the 30 pin plug, a tactile feel. The same problem applies to the USB side of the same cable, and all other devices that have seemingly ever shrinking connectors. 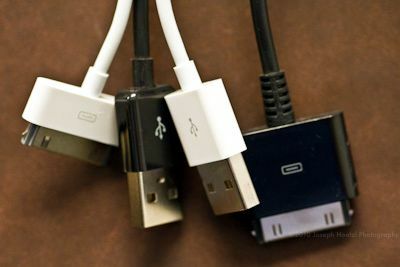 Perhaps it is just me, but if you ever had to pause to insert that charging cable, dock connector, or whatever cable into a device, and then have to turn it over because you went to insert it the wrong way around, then you know what I am talking about. If the manufacturers would just add a raised dot in place of the USB logo, the “iThing” logo, or whatever they use to show the proper orientation/insertion direction, it would eliminate this problem. I do believe I’ve seen some cables that have this, but not one of the dozens of USB, Firewire and “iThings” cables I have, have it. So, what do I do while the manufacturers neglect this little feature? I make them with a hole punch and some P-Touch tape. The tape from a P-Touch works very well, but other tapes may work fine as well. The idea is to get something that stays put, and has enough thickness that you can feel it. The reason for the “hole” is that it has no hard edges or corners which would make the tape much easier to catch something and come off.